STYLE TRAVEL LIFE: TRAVEL: How to visit Zagreb like a local? TRAVEL: How to visit Zagreb like a local? After taking a break from blogging, I am writing you a post about my city. The city of Zagreb. These are my tips for visiting the city of Zagreb as a local. We all know the saying ''When in Rome, do as Romans do''. If you are living in Zagreb or just happen to come here, don't miss the chance to enjoy this beautiful city. All year round, the city offers different contents, where everyone can find a little bit for himself. This comes first because it has become a cult place for drinking your morning coffee. Especially on weekends, this is this city's favorite activity. It is an opportunity for hanging out with old and meeting new friends. I suggest everyone to get high on the good vibes and decide to look for a cafe in the city center. Here they will be able to observe the people passing by while enjoying a good cup of coffee. If you really want to feel like a local, head down to Cvjetni square on a Sunday morning for a cup of coffee. Now that you had your morning cup of coffee, you could do a little bit of shopping. 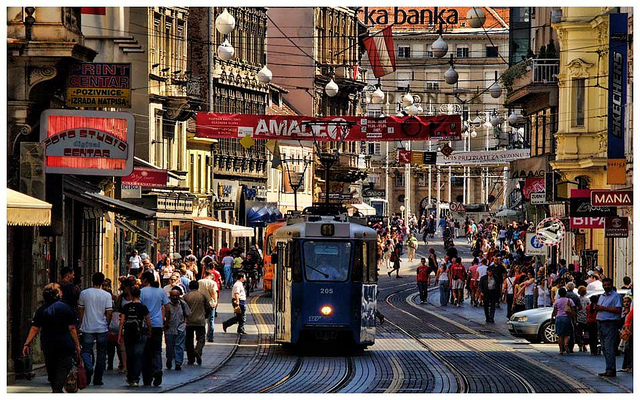 Downtown Zagreb offers many shops which will allow you to update your wardrobe (and makeup ;)). In close proximity, you can find ZARA, H&M, MAC and many other popular brand stores. My advice would be to also check some of the local shops with domestic brands. You can find a really good second hand shop in Dežmanova street. Also, there are some nice tea and coffee shops around. After the shopping has exhausted you, go grab some ice cream. My personal recommendation: Chocolat 041 in Masarykova street. Zagreb also offers some of the most beautiful architectural creations, which can give you a sense of the past. The most famous one being the Cathedral, you can also take a stroll along Lenucijeva potkova (''Lenuzzis horseshoe'') - a set of streets with green surfaces and beautiful buildings around them. Also don't forget to look up, because you might just find some exceptionally beautiful buildings. There is also a lot of public sculpture, created by famous and very talented Croatian and foreign artists. If you are an art lover, you should head to one of many museums offered in this city. There is something for everyone, some good places to visit are the Museum of Contemporary art, Zagreb City Museum and the Modern Gallery. Zagreb offers a lot of beautiful green areas where you can take your dog for a walk or just take a stroll. Don't miss the chance to go to Sljeme and enjoy the fresh mountain air there! Try food from a restaurant up there (tasty and not too expensive) and if it's winter time (and if there is snow) you can also go skiing up there. Furthermore, there are parks like Zrinjevac (very close to the city center), Maksimir (only a 10 minute drive away from the center) and Dubravkin put, which is as much inside the city as it is quiet and distant from the traffic. Did I tell you there is a lot to do and see in Zagreb? Well, there is. If you want to go to the cinema - you can go to Branimir mall, where there is the Cinestar. It offers a decent amount of popular movies and they are not translated but have subtitles, so even if you don't speak Croatian, you can go and see them (double check for animated movies though). If you like movies that are not mainstream, head to Kino Europa.. You might find something for yourself there. There are also many theaters to visit, the most famous one being HNK (Croatian National Theater), but also a bit more laid back ones like Komedija and Kerempuh. Whichever one you choose, it should be interesting. Every season Zagreb offers a new past time to go out in the evenings and experience the city life and atmosphere. In the winter months there is a fare and many places to drink mulled wine from and have a bite to eat. In the summertime they organize events around the city to go to and enjoy concerts and local food. Now this is an opportunity you don't want to miss. Definitely last but not least! People from Zagreb love going clubbing. There is a variety to choose from, and it can suit everyone's taste. It's not too expensive to get in. The drinks are a bit more pricey than outside the club, but you can act as a local here too and just go and have a few drinks somewhere else before you go to the club. I hope this will be interesting to those who want and also to those who are thinking about visiting Zagreb. Croatia has a lot to offer, Zagreb is a part of it. I plan to write about it some more in the future. Be sure to leave a comment below and let me know what you think. good post! i was in Croatia one summer and i love it!! Thank you :) Yeah, Croatia does have a lot to offer! Thank you for sharing your tips! Zagreb sounds amazing. Beautiful pictures! Zagreb looks amazing! Your city looks beautiful and sounds exciting to spend some time. Would be fun to live like a local. Great tips- Zagreb sounds so fun with so much to see! Thanks for the tips, it looks awesome! I definitely have to visit Zagreb one day! I really don't know enough about this part of Europe. Stunning pictures, such a wonderful city! I have never been to Zagreb but now I want to visit it! Fashion: Favorite Spring/Summer Trends 2016!